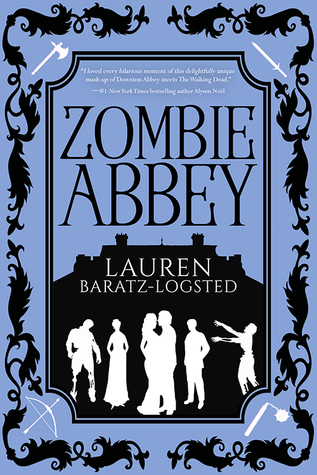 We're thrilled to have Lauren Baratz-Logsted join us to chat about her latest novel, ZOMBIE ABBEY. Lauren, what was your inspiration for writing ZOMBIE ABBEY? A couple of years ago, the juxtaposition of the words ZOMBIE ABBEY came to me and immediately, I thought with delight: 'That should be a thing!' So I set to work, making it a thing. I hope readers will agree, that it should in fact be a thing. When you have a piece of work - be it a book, TV or film - that involves zombies, it feels like you're cheating the reader if you don't kill off at least one big character. So I knew from the start that, to play fair, one character I loved would have to be sacrificed. But I didn't know who it would be far in advance and when I did know and it came to writing it, I found the loss deeply affecting. I hope readers will feel the same. Beyond that, the book has a large cast of characters with most chapters being from a single character's point of view. But there are a few one-offs, like the chapter in which there's a dance and it jump-cuts among different characters - some making quite strange bedfellows! - and the conversations they have. Getting to have the kitchen maid dance with a member of Upstairs, and surprise him with her knowledge of Shakespeare - that was fun to write. Honestly, if you love Downton Abbey, you're in. Oh, and it's not necessary to love zombies. I, myself, am not a huge fan of zombies! So what I've created is more of the satirical/campy variety. There's a little bit of gore but hopefully a lot of laughs and some romance too, of course. What do you hope readers will take away from ZOMBIE ABBEY? Honestly, I just want them to have fun! Sometimes, you write a book with a deeper message and you hope that at least some readers will 'get it.' But given the distressing state of the world, if people read ZOMBIE ABBEY and come away from the experience saying, "Well, that was fun," I'll feel like I've done my job. I wrote seven novels over nearly eight years before finally selling one of them in 2002. Since 2003, I've had over 30 books published. So the road was long but worth it. And, now that I'm in, it'll be tough to convince me that I should get out. I go downstairs to my office in the basement - a windowless room I refer to as my basement cave - and I turn on the computer and I start to write. That's as exotic as it gets for me. I say the same thing every time because it's the truest thing I know about writing. Read, read, read - read everything you can get your hands on because you can't be a good writer without being a great reader first - and always remember: The only person who can ever really take you out of the game is you. Promotion for ZOMBIE ABBEY! Also, promotion for the other two books I have coming out this year: The YA novel I Dream of Johnnie and the adult novel The Other Brother. Lady Lizzy, so endlessly sunny, it's easy to underestimate her. Then there's Will Harvey, the proud, to-die-for―and possibly die with!―stable boy; Daniel Murray, the resourceful second footman with a secret; Raymond Allen, the unfortunate-looking young duke; and Fanny Rogers, the unsinkable kitchen maid. Lauren grew up in Monroe, CT, where her father owned a drugstore at which her mother was the pharmacist. She is a graduate of the University of Connecticut at Storrs, where she majored in psychology. She also has what she calls her “half-Masters” in English from Western Connecticut State University (five courses down, another five to go…someday!). Throughout college, she worked semester breaks as a doughnut salesperson, a job that she swears gave her white lung disease from all the powdered sugar she breathed. Upon graduation, she began work at the venerable independent spacebookseller, now sadly defunct as such, Klein’s of Westport. There, she bought and sold for the better part of 11 years. In November 1994, Lauren left the bookstore to finally take a chance on herself as a writer. Success did not happen over night. Between 1994 and May 2002 – when Red Dress Ink called with an offer to buy THE THIN PINK LINE – Lauren worked as a book reviewer, a freelance editor and writer, and a window washer, making her arguably the only woman in the world who has ever both hosted a book signing party and washed the windows of the late best-selling novelist Robert Ludlum. Since Red Dress Ink’s call in 2002, Lauren has been kept very busy with writing more novels and checking her Amazon ranking on a daily basis. She still lives in Danbury, with her husband and daughter, where she has lived since 1991. In addition to writing, Lauren’s daughter keeps her busy, accounting for the rest of her time. Lauren’s favorite color is green. Lauren’s favorite non-cat animals are penguins. Lauren wants you to know that, however you are pronouncing her last name, you are probably pronouncing it wrong. Have you had a chance to read ZOMBIE ABBEY yet? Do you hope people have fun reading your books? Are you reading everything you can get your hands on? Share your thoughts about the interview in the comments!